The origins of the Wiccan Tradition have long been a subject of debate amongst practitioners and scholars alike. Did Gerald Gardner invent the tradition? Is Wicca a survival of a British folk magick system? Could it be a continuation of a European tradition of Pagan Witchcraft? Might it be that it evolved from Victorian ceremonial magick, or perhaps it is the modern manifestation of the medieval Grimoire Tradition? In this book the authors explore the possible beginnings of the tradition by examining the practices in the context of magickal and spiritual thought spanning thousands of years.Through setting aside the endless debates about initiatory lineages, they look beyond the personalities of the people and instead focus on what they consider to be at the heart of the tradition – the practices. Evidence from many previously uncredited and unconsidered sources is examined. This clearly shows how all the significant component parts of Wiccan ritual and practice have roots reaching back, in some instances thousands of years, before its public emergence at the hands of Gerald Gardner in 1950’s England. They explore the sometimes surprising antecedents for key practices such as initiation, magick circles, ritual tools, the invocation of the Guardians of the Watchtowers, Drawing Down the Moon and The Great Rite. The precedents for the Book of Shadows, Wiccan Rede and Charge of the Goddess are also considered as part of this groundbreaking work. Wicca Magickal Beginnings may well answer as many questions as it creates about the true origins and nature of what is probably the most influential of the Western Esoteric Traditions today. Through combining scholarly research with practical knowledge, the authors clearly illustrate that the future of the tradition lies in utilising the rich diversity of its past, through the appreciation of its magickal origins and the untapped potential inherent in it. 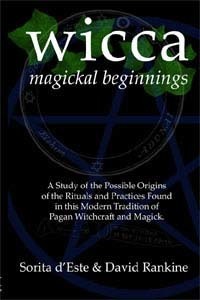 This book will be invaluable to anyone with an interest in the history, practices and beliefs of the Wiccan Tradition – and its links to Paganism, Witchcraft, the British Folk Traditions and Ceremonial Magick.